Illuminating clothing, footwear or other fashion accessories inspire a growing number of designer who explore the possibilities of active light elements for fashion. 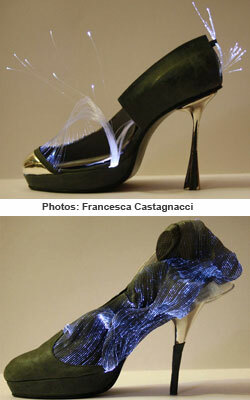 Italian-born fashion designer Francesca Castagnacci used the active light element as her inspiration to design Heels that contain fiber-optic material to emit subtle, classy soft color shades, not the usual, bright flashing color spots but discrete illumination. Luminex, one of the leading companies that create optical fibers specifically to be used for fashion applications produces long, very thin strands of pure glass or plastic, no thicker than a human hair. These optical fibers are suitable to be woven together with conventional yarn to fabric structures. The optical fibers themselves are not light emitting but need one or more LEDs on each end of the fiber or bundle of fibers. By using RGB (Red, Green Blue) LEDs a simple program on an IC can created almost any color shade. The LED light travels through the optical fiber which is specially treated to allow light coming out along the fibers surface. The effect is a subtile, almost mystical illumination. These illumination fibers combine with the design skills of people like Francesca Castagnacci bring sparkle to high end fashion objects.